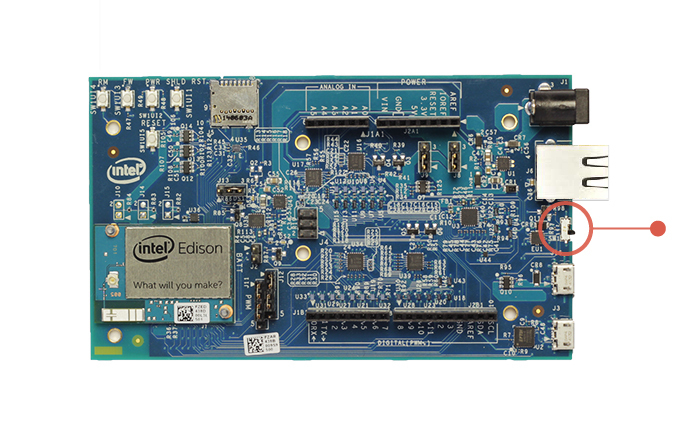 This guide explains how to get started with your Intel® Edison. In this guide it is assumed that you are using an Intel® Edison kit for Arduino, but the same explanation is valid for the Intel® Edison Breakout Board. It is also assumed that you have connected the Intel® Edison to the Breakout Board. If not please make reference to the Intel® Tutorial about how to do that. The Intel® Edison board is programmed using the Arduino Software (IDE), our Integrated Development Environment common to all our boards. You should have already it installed on your PC, as explained in the home page of our Getting Started. 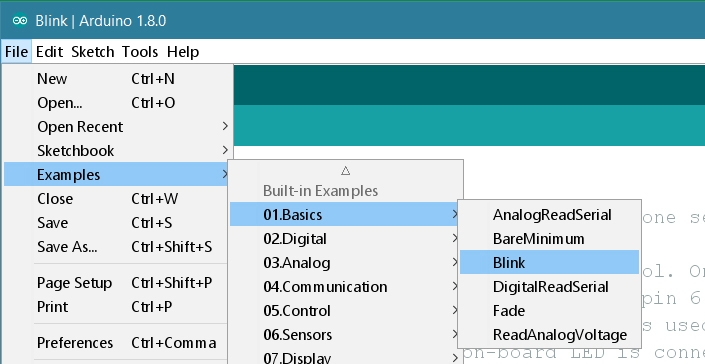 The next step requires the addition of the Intel® Edison Core to the Arduino Software (IDE). This simple procedure is done selecting Tools menu, then Boards and last Boards Manager. Select Arduino Certified as type and then click on the Intel i686 boards by Intel. 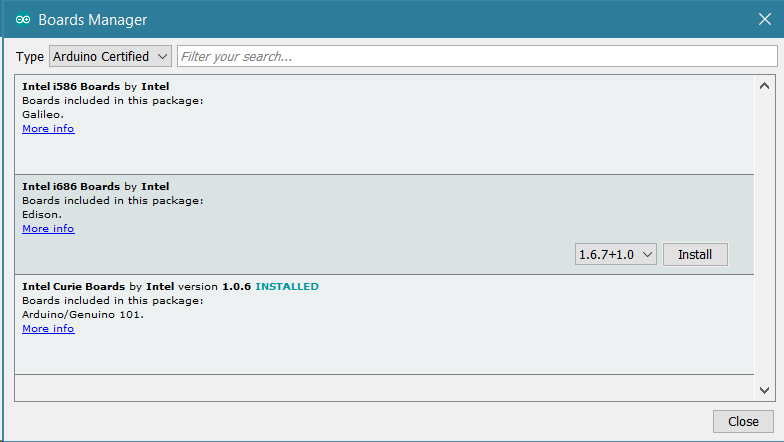 Select the latest core and then Install. 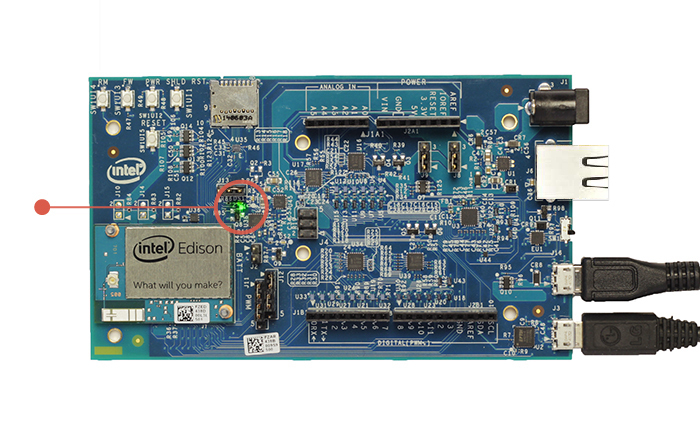 When the process is completed, the Intel Edison board will be available in the boards list. 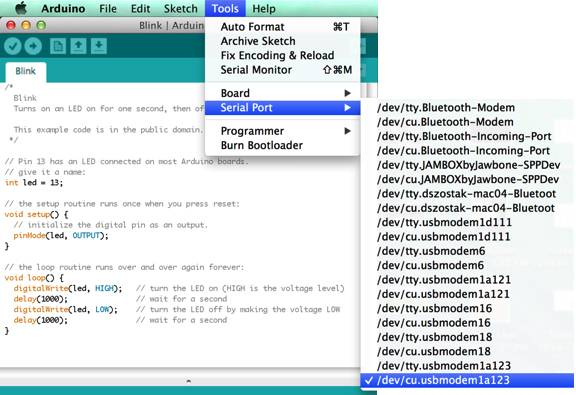 To upload Arduino sketches the Intel® Edison board must be powered up and connected to your computer. It is suggested to use two micro USB cables to connect the board to your PC because in this way more current is available if needed. A green light should light up on the expansion board. If it does not, check your connection. Wait a moment for the board to boot up. You will know that the board is fully initialized when your computer mounts a new drive (much like inserting a SD card into your computer). 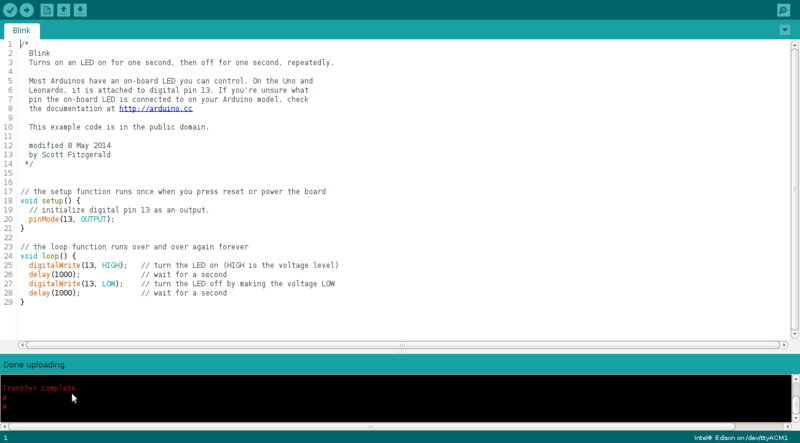 Note: If you do not see a new drive, and the LED light (DS1 on the Arduino expansion board) is occasionally turning on and off, it is likely that your computer is not providing enough current. You may need to use a DC power supply as explained at Power Through DC Plug here. 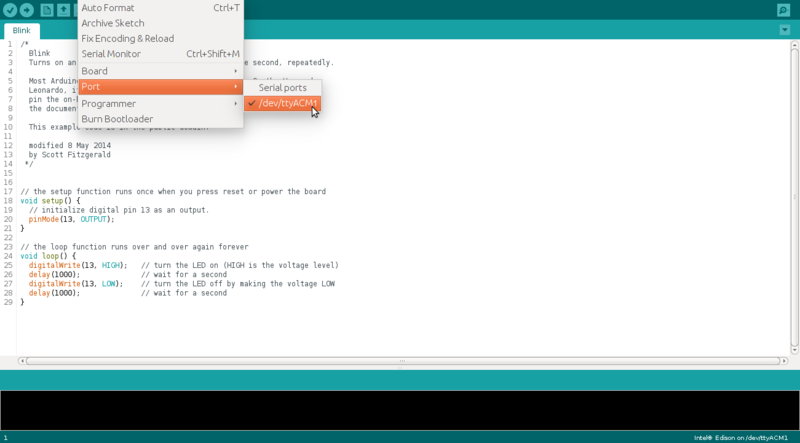 Select the serial device of the board from the Tools > Serial Port menu. 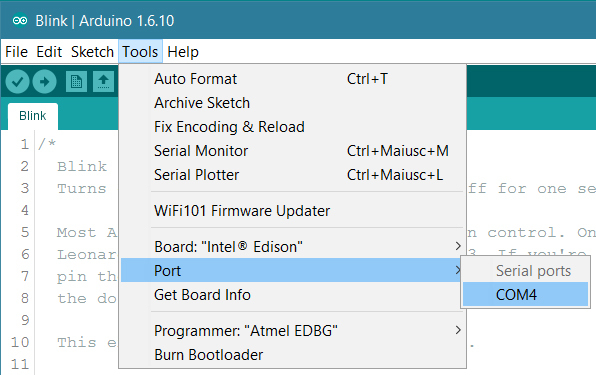 The easiest way to find what port the board is using is by disconnecting your board, restarting the IDE, and re-opening the menu; the entry that disappears should be the Intel® Edison board. Reconnect the board, restart the IDE, and select that serial port. The DS2 LED on your board should now blink with a 1 second delay. 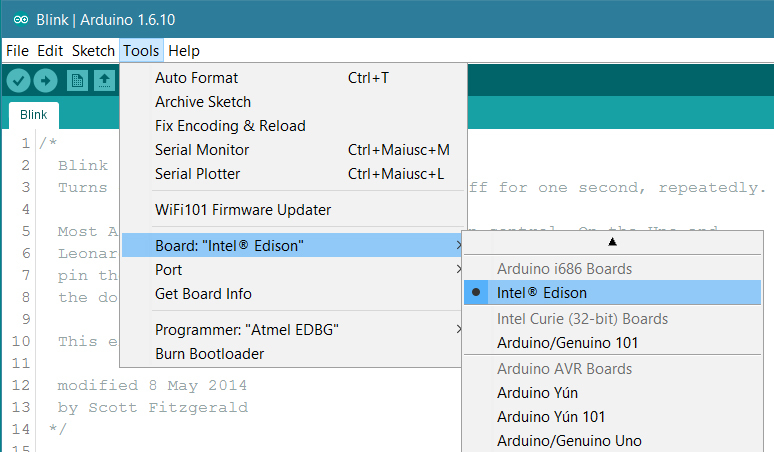 You have successfully set up your Intel® Edison board and uploaded your first sketch. You are ready to move on with our tutorials and projects: choose your next destination below. Now that you have set up and programmed your Intel® Edison board, you may find inspiration in our Project Hub tutorial platform, or learn how to use the specific features of the Edison board.